Peach Salsa ! Yum ! From bluesmokesalsa.com, originally uploaded by shashiBellamkonda. What do you do when a product you receive to review , turns out so good that your entire family including a toddler have already reviewed it by the time you got home. :) This salsa is made by bluesmokesalsa.com. I am usually a chutney guy ( guess where I am from originally) and don't really enjoy the regular salsa from grocery stores so we make our own when we have friends. 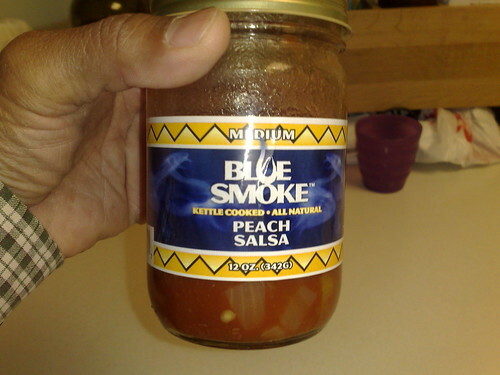 The reason I expresses interest in this product was because "peach " salsa was new to me and this company is a small business from my neighboring state of West Virginia. Robin Hildebrand is my facebook friend and I think she makes a great Peach Salsa.